Version 3 boots fine, 4 does not. I have, but have **YOU** played Atari today? I mount the disk image, turn on the power, it makes the farting noise, and then goes right to basic. Multiple disk images tried. Close down, open version 3 back up, and they boot fine. Hardware is the serial version of SIO2PC, with a USB adapter. As mentioned, 3 works fine, and 4 will not boot. Both use Serial port 2 if that makes a difference. Would also like to get APE to work, as I like the colorful display and all the options, and would really like to get BobTerm going so I can get back on some BBS'es. What platform? Windows? What version of Windows? Have you tried running it in compatibility mode? 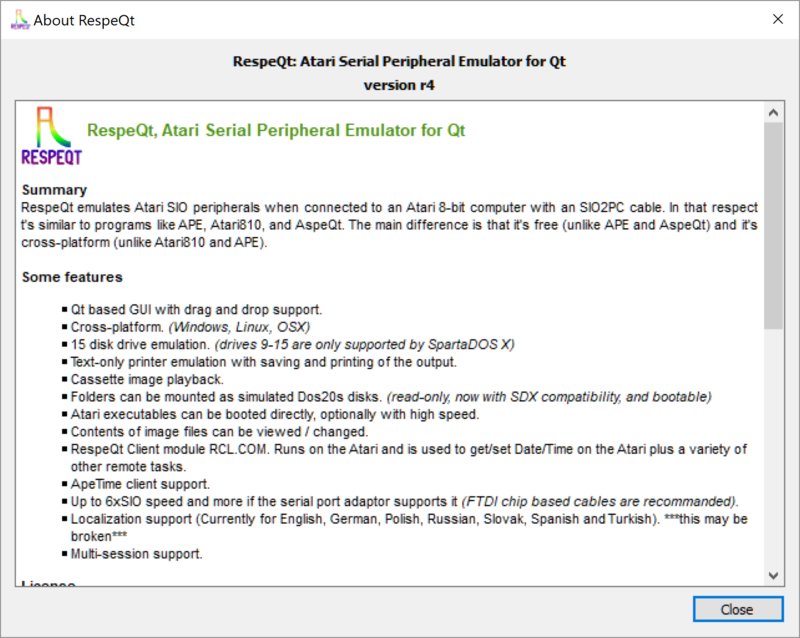 RespeQt r4 works for me under Win10, though I usually use one of my Raspberry Pi units on full-time "Atari duty." ​Can't help you with APE as I don't use it. The program runs, it will just not boot disk images, whereas 3 is fine. Windows 7. Next questions - did you compile yourself or download the Win32 binaries from GitHub? Have you tried different SIO speeds in the options? Have you tried multiple disk images or XEX files? These details might help narrow down stuff in case Joey Z. or The Montezuma or whomever can find a bug in stuff that changed between r3 and r4. Also, which handshaking method? Are there any messages in the log window? Lastly, we changed the method of serial port selection in RespeQt with this latest release. Please try selecting a different serial port in the options menu, save the settings, then again select the correct serial port in the options menu, and save the settings again. I don't remember off the top of my head how the serial port selection works in handling invalid settings in the configuration file, but it's possible there may be two entries in the list which appear to be correct, in which case you should attempt to use the other one. That's really the only change I can think of that would cause this, is that you're not successfully opening the serial port. This is why you need to post the contents of the log window, there may be an error about this there. Edited by Joey Z, Tue Aug 1, 2017 7:21 PM. Edited by scotty, Tue Aug 1, 2017 10:54 PM. Tried Com1 and Com2 both just made the farting noise and went in to Basic. PS, I have the Ultimate Cart and the Ultimate 1MB installed. No matter what OS or whiteout the cart, still does the same thing, yet no problems on version 3. I will be out of town today for work, and will not be back till tomorrow morning, I will try to record a detailed video when I get back. what kind of serial SIO2PC are you using? I don't suppose you happen to know if it requires DTR and RTS to be in a specific state? the behaviour of these lines was changed between r3 and r4. I have the Steve Tucker (AtariMax) version. C) 2005. I use No Handshaking on 3 and it works fine. Same thing.... 3 boots fine, and 4 Test makes the farting noise. Edited by scotty, Thu Aug 3, 2017 10:16 PM. OK, well the only other way to go about this is for me to start building from various commits and trying to narrow this down. I'm not doing that now, I have to get some sleep and move my stuff down at school tomorrow, I can't get around to it until next week at the earliest. No problem at all. Take your time. 3 works fine, so I have that to use until you can find a solution. I am in no hurry, and appreciate your time and effort. FWIW, I was just in your area the other day (Wednesday). I am a motor coach operator, and drove Cedar Point employees to Navy Peer for the day. Been to the Chicagoland area quite a few times. Always enjoyable. Edited by scotty, Fri Aug 4, 2017 5:32 AM. Edited by _The Doctor__, Sun Oct 29, 2017 4:43 PM. Please select the checkbox "Trigger on falling edge" and report if it helped. Sorry, you are right, I submitted it, but the change didn't manage to the master branch (is still in the develop branch). The Windows implementation of the serial port layer had a bug in the previous versions of the RespeQt/AspeQt. It is event based and the worker thread was woken up on every change of the command line signal (on rising and on falling edge). Normally the command line goes high and the worker thread shall be woken up on the rising edge to read a command frame. If the worker thread is woken up on the falling edge it may lead to misinterpret a data frame as a command frame! Starting from Release 4, the worker thread does nothing if woken up on the falling edge. That's why I added a checkbox to inverse the logic. Please change the handshake to "NONE" or to "SOFTWARE (SIO2BT)" and give it a try. In those two modes the above logic does not apply. Edited by TheMontezuma, Mon Oct 30, 2017 4:34 AM. Sorry, you are right, I submitted it, but the change didn't manage to the master branch (are still in the develop branch). There was one more change introduced in R4 that resulted from problems reported by SIO Cart developers. It is about DTR and RTS lines. Until R4 they were cleared when the serial port was opened. I will locally roll this change back and prepare a new R4 binary for you (if you are so kind and could retest it once again).